Last month’s release of e-mails between the Pennsylvania Attorney General’s office and Louis Freeh’s investigators was a partial victory in the hunt for the truth. They showed a clear bias toward creating a final report that matched the narrative originally established by prosecutors in November 2011. But the disclosure didn’t go far enough. The AG’s Right-to-Know Law officer withheld an unknown number of records that he said could stay secret because they were subject to grand jury secrecy rules and the RTKL’s criminal investigation exception. Unconvinced that the reasons for the partial denial were correct, I appealed the decision to the next level – another person in the AG’s office. Today I got the final decision. And it’s not helpful to those who are still trying to uncover what went on behind the scenes during Freeh’s investigation. In a letter dated April 23, 2013, Linda Dale Hoffa, the AG’s senior executive deputy attorney general, told me that after a “careful review of the content and nature of the withheld documents,” she agreed that the records are not subject to grand jury secrecy rules. “However, I am persuaded by a preponderance of the evidence that the withheld documents are records … relating to a criminal investigation,” she wrote. Unlike most states, the Pennsylvania legislature exempted every record of every investigation from disclosure. State officials can permanently withhold any document “relating to” both criminal and noncriminal investigations. State agencies can, by their own accord, choose to release pretty much any record they want to release. But that rarely happens. 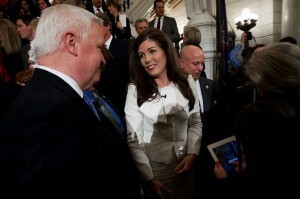 True to the norm, newly elected Attorney General Kathleen Kane is asserting her right to keep those records secret. The RTKL’s investigation exceptions are among the many frustrating aspects of a 2008 law that was billed as a dramatic improvement over its previous, toothless version. The exceptions, for some reason, are much broader than any of Pennsylvania’s neighbors. Until Pennsylvanians demand more open and transparent government, much of the real story behind the Sandusky scandal will remain sealed from public. All politicians talk about the need for “transparency” and “openness in gov’t.”-until they get elected and have information THEY don’t want the public to know or think the public shouldn’t know. Which defeats the whole purpose of a “Right to Know” law. If we have a “right to know,” that means EVERYTHING. Let the public decide what they NEED to know. Until gov’t. learns to be on the side of the people, we have no real freedom. Perhaps Freeh, being a lawyer himself, persuaded Kane it wasn’t in the public’s best interest to see the Freeh emails. Which tells me they are damning evidence against the Freeh Report’s “process” and investigative methods and conclusions. If not so, why not release them? It would just prove Freeh was right and his critics are wrong. If it is the truth, then releasing any documents even before a trial should not be a problem. Please release everything now! I want this RTKL secrecy stopped and all government agencies and university to be fully transparent. Hiding facts on a random basis only leads to…….corruption.